Stopped by on Saturday night to pick up some of their homemade chorizo. Grabbed a couple of tamales out of the steaming pot they had by the checkout. Really tasty. The pork was spicier than the chicken, but both had great, slow-cooked flavor. Went back today for the first time in a while and was introduced to the Michelada (Mexican spicy beer)! Will be back for more! Mexican beer, some clamato, about a half-dozen spices and sauces and lime juice. Just what the doctor ordered on a Saturday morning! 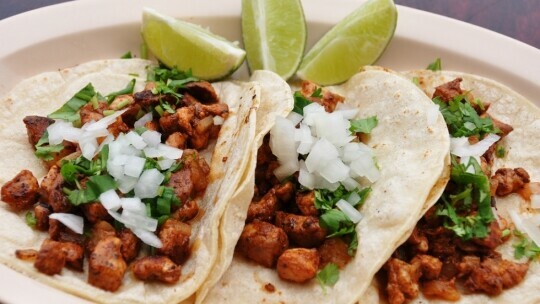 Make yourself experience lunch in a traditional taqueria right here in Eau Claire. Wonderful tacos on homemade tortilla. Great guacamole. Very friendly staff. Get a real coke with a slice a lime to go with it. It's great to have some authentic style mexican to eat, vegetarian friendly, I went on the recommendations already listed and was not disappointed.